You know it's spring when the the mooring balls go in at Belmont Harbor. 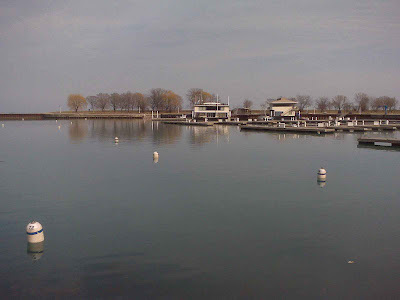 The first picture was taken on the bike path at Belmont Harbor and looks south east toward the Chicago Yacht Club Belmont station. Donnybrook's summer home is just to the right of this picture. Mooring balls in the foreground. Chicago Yacht Club Belmont Station in the background. Looking east from Belmont Avenue/bike path. The view below is to the north and shows the main part of the harbor. Notice the lack of star docks? 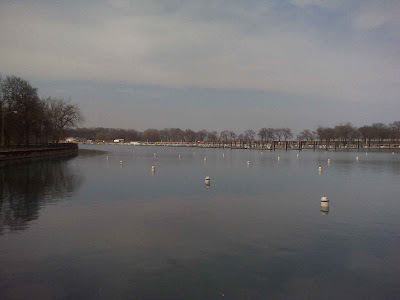 Westrec/Chicago Park District has removing several of the star docks to make way for more docks. Over 100 new slips will be added. A map showing the configuration is here. It'll be interesting to see how they handle restrooms and parking for all the new boaters and guests. Note the missing star docks. While looking for information on new amenities at Belmont Harbor, I ran across the Chicago Harbor Lakefront Harbor Framework Plan from 2007. This interesting document is a 20 year plan for Chicago's harbor system. ﻿﻿A proposed master plan for Belmont Harbor is on page 67. If the plan is executed, Belmont Harbor will look dramatically different and will be a much busier place than it already is. There's a lot of information in this 70+ page report. The economic impact (Donnybrook spends $6,893 each year if you believe the report, page 12) is interesting. The 31st Street Harbor, under construction, is detailed on pages 40-43. The new Gateway Harbor plan is on pages 48-51, and a DuSable East Harbor is on pages 52-56. I've only skimmed it so far. Time permitting I'll do some research and share what I learn about the Chicago Park District's short and long term plans. Where are Megan and Maureen?